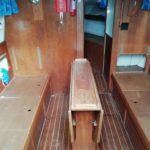 Westerly Konsort 29 for sale. The Westerly Konsort was Laurent Giles last design project for Westerly Yachts and also their most successful, excepting the Centaur of course. It was deisnde asa mid- sized boat between the 26 foot Centaur and the Longbow/ Berwick/ Pentland 31 foot range. The westerly Konsort 29 was introduced in 1979 and remained in production until 1993, with over 800 built. The Konsort remains one of the most popular Westerly designs offering a great deal of interior space for a 29 foot hull. The interior layout is traditional with forecabin/heads/ saloon/galley and chart-table arrangement. So plenty of stowage and wide berths. The saloon has a fixed table with flaps and bottle stowage. This is an extremely popular, safe family cruiser that is equally at home crossing the channel or exploring creeks. STRING OF PEARLS benefits from a replacement engine, installed about 10 years ago and modified 2 years ago for easier starting. The sails were also replaced 10 years ago. Masthead sloop rig, deck stepped mast with standing rigging replaced in 2006 and checked in 2011, mainsail reefing and headsail furling. Bilge keels with transom hung rudder. This Westerly Konsort 29 can sleep seven in three double and 1 single berth in three cabins including the saloon. This is a sea kindly easy to handle boat that has been well maintained. Just lifted ashore for the winter at Noss on Dart Marina.